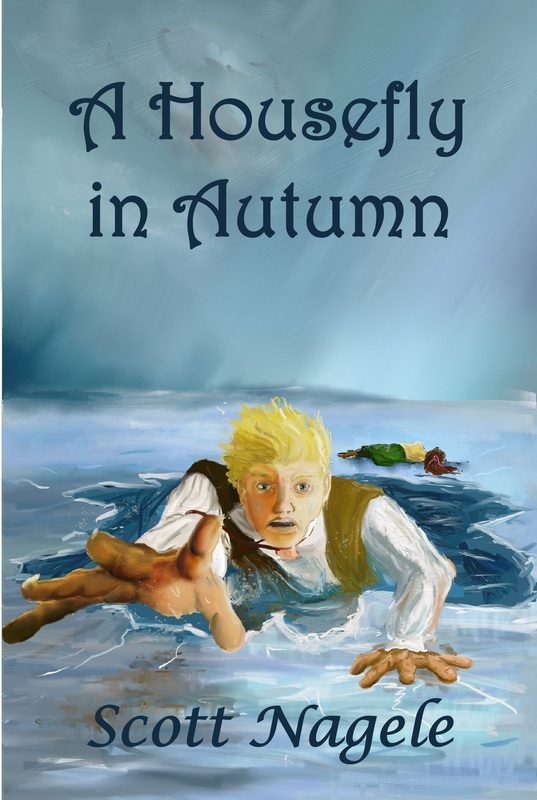 If you’ve visited before, you may know that I have self-published a few books. When you self-publish enough books, you get noticed. Some authors get noticed by readers, but I find that I get noticed much more often by aggressive marketers, trying to sell me their publishing platforms. These platforms usually come at a high price for very little useful platform, so I disregard the advertisements. I am ignorant of publishing scams. I harbor dreams of penning the autobiography of my quietly fascinating life. I do not know what the word fascinating means. Before tossing the piece into the recycle bin, I turned it over to make note of the name of the publishing company trying to take advantage of my feeble-minded sense of self-importance. That’s when it hit me. Publishing companies, even the shady ones, don’t have Memory Gardens in their names nearly so much as cemeteries do. I am not being recruited by a shady publisher, but by a shady plot in a peaceful meadow. They’re not trying to sell me a two-bit book layout for my memoirs; they’re trying to sell me a hole to bury my carcass. This is disturbing, because nowadays these marketers know more about you than you do. Last year, AARP was all over my 50th birthday like flies on sheet cake. 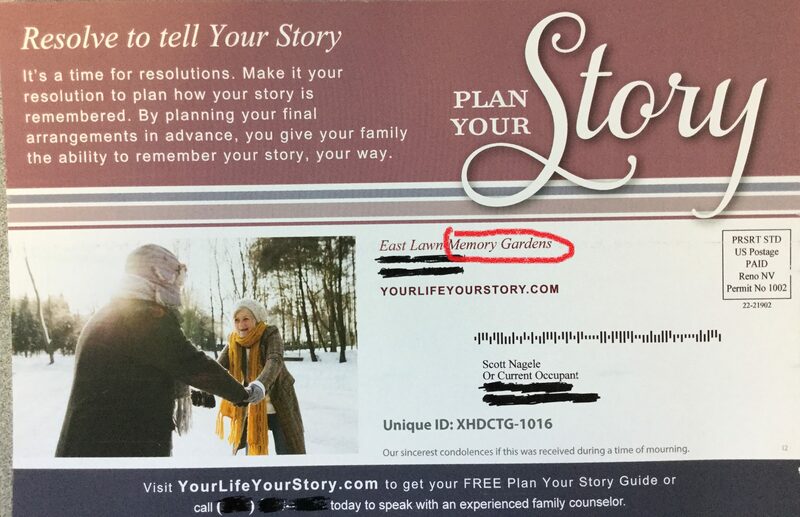 What does Memory Gardens know about me that puts me on the same prospect list with Great Depression Babies? 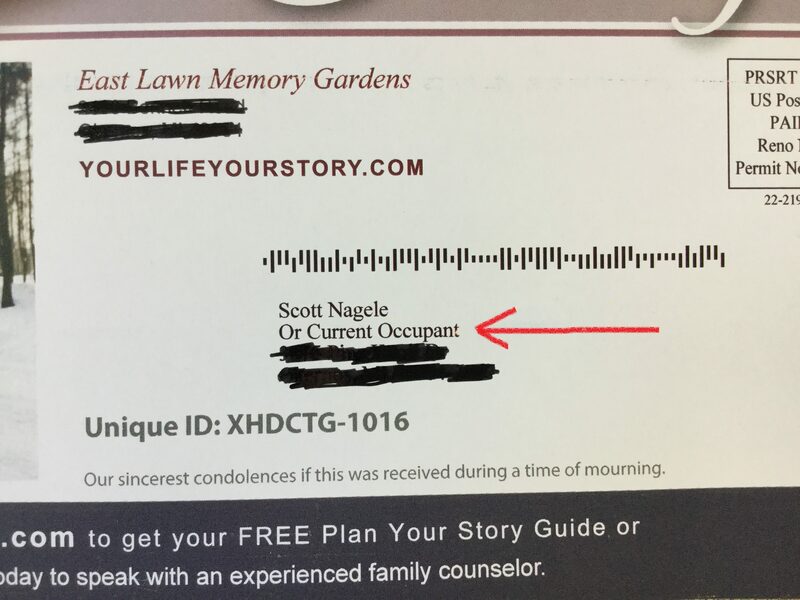 Should I take heart that it’s addressed to me OR whomever took up residence in my death trap of a home after my demise? I guess the best thing is to find the humor in it, of which there is plenty. I do enjoy the Resolutions theme: A new year is a time for resolutions. 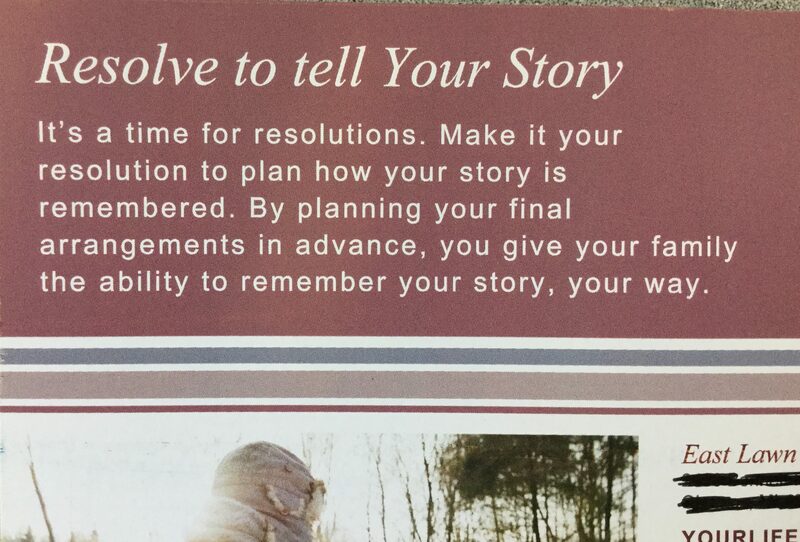 Why don’t you resolve to die this year? I also like the appeal to the control freak: By planning your final arrangements in advance, you can still tell everybody what to do even after you’re dead. After all, you wouldn’t want them to grieve in any way but the one that suits your departed ego. Having considered all this, I’ve decided I’m not writing my autobiography or resolving to die this year. 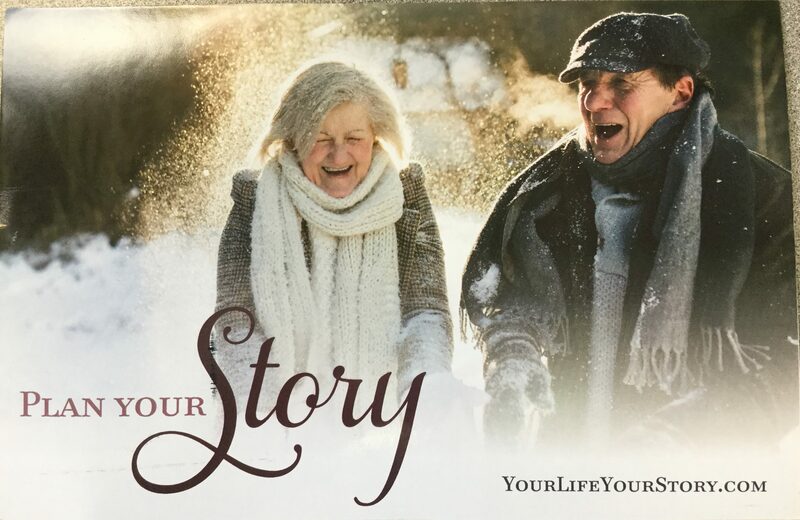 I’m hoping to keep my story to myself for a while longer.